Pizza can be found all over the world. Thin crust pizza, deep dish pizza, round pizza, square pizza, all kinds of pizza. What distinguishes a good pizza is its crust, sauce and choice of toppings. The way the pizza is baked also influences its flavor and texture. I will write more about each of these components in a separate post about pizza making. Here I will focus on pizza crust, and more specifically on sourdough pizza crust, and the way it acts as the foundation for your pizza. For years I’ve made pizza at home in my oven. My oven, by the way, was an old gas oven, which was very unreliable, yet usually gave me wonderful results. For the crust I relied on the Joy of Cooking ‘s recipe on p. 610 of my very-worn older-edition from the 1980s. I always replaced honey for the sugar, but otherwise followed the recipe. My kids, who now are full-grown adults, love the crust from this recipe. Every time I talked about trying another recipe, they’d stop me. So if I wanted to experiment it had to be without them. You can roll the yeast pizza dough from Joy of Cooking’s recipe either thin or thick, however you prefer. The honey makes the dough softer. It also mixes well with the flavor of the olive oil added at the same time. The dough is moreover fairly easy to stretch and toss like professional pizzaiolos (aka pizza makers) we see in the movies or neighborhood restaurants. In recent years, I’ve often looked for ways to use up the excess or discard sourdough starter fermenting in my kitchen. It was therefore natural to start making Sourdough Pizza Crust, among other goodies. See for example my recipe for Sourdough Pancakes – Sweet or Savory. So far the results for the Sourdough Pizza Crust have been fantastic. The crust has a good texture with a slight spring to it. Its crumb is modestly soft so even when the dough is rolled thin, the pizza crust will not be too hard. The flavor of Sourdough Pizza Crust is better, in my opinion, than for a yeast pizza crust, which can have a yeasty aftertaste. While the sourdough pizza dough ferments, its flavor improves. The only downside so far has been my inability to stretch and toss the sourdough pizza dough the same way I could with its yeast counterpart. Sourdough pizza dough spreads out fine if you place it down on a hard flat surface and use the back of your hands to stretch it gently. I might just not have developed the technique yet. Nevertheless, the final crust when baked is still excellent. Why Bother Making a Sourdough Pizza Crust? As a Sourdough Pizza Crust takes longer to ferment and rise than a yeast pizza crust, why spend this extra time? Is it worth it? First, the extra time it takes is passive time. This means it’s additional time that you let the dough sit and rise while you continue your other activities. All you have to do is remain patient. Second, making a Sourdough Pizza Crust is a wonderful way to use up your sourdough starter. Dedicated fans of sourdough starter will be excited to find a new way to use some excess sourdough starter. Read this useful guide to discover more tips on how to make, maintain and use sourdough starter. 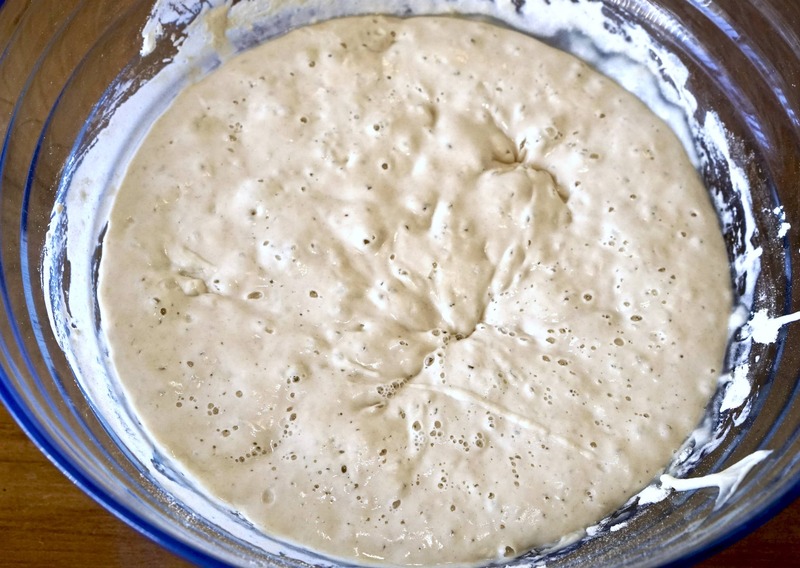 Third, sourdough starter will make your pizza crust a wee bit more fluffy and chewy. This change of texture is subtle, not something that most people might notice. However, with a more active starter or a longer fermentation time, your crust will have more spring. Fourth, you can obtain a more tangy taste by using excess or discard starter that needs to be fed or has been starved a while. Yet, if you use a sourdough starter that has been fed regularly, the change of flavor will be almost undetectable. What’s Different About This Sourdough Pizza Crust Recipe? You can find loads of recipes for Sourdough Pizza Crust on the Internet. Therefore, what makes my Sourdough Pizza Crust recipe different or better than the others? I’ve examined the top three recipes in Google search to determine how my recipe differs. Note, I’ve made this comparison after developing my own recipe. Fortunately, you can see the main differences in three other recipes. King Arthur Flour’s recipe, like many others, call for an addition of another rising agent, such as yeast, baking powder or baking soda. Mine does not. It relies only on sourdough starter to help it rise. You might save time by adding another rising agent, but it’s not necessary. Also, as mentioned above, yeast as well as the other rising agents can leave a slight aftertaste. Meanwhile, Cultures for Health’s recipe, like other recipes, skips the long fermentation rising time. Instead, after a short rising time, you roll out the dough and make your pizza. My Sourdough Pizza Crust recipe calls for the creation of a sponge: the first mixing of the sourdough starter with the water and half of the flour. By letting the sponge sit overnight, the wild yeast in the starter will continue to multiply. During this time, the sponge’s flavor will develop and mature. The next morning you will add the remaining ingredients and start the bulk fermentation. For more information on these bread-making terms and the process of making bread, read this useful guide. By creating a sponge in the first phase, my recipe allows you to have one long fermentation period. However, some recipes call for two risings in order to give the dough time to grow. In The Perfect Loaf’s recipe, for example, the pizza-maker creates a levain, then adds the remaining ingredients for the bulk fermentation phase, and ends with the proofing of the dough. My recipe skips the second rising during the proofing (like many other recipes do), saving one step. The total time (passive and active time), however, might be nearly the same. How Do You Make Sourdough Pizza Crust? The process for making Sourdough Pizza Crust takes up to twenty-four hours, depending on the choices you make. Rolling the dough out, adding the sauce and toppings, and baking the pizza in the oven. 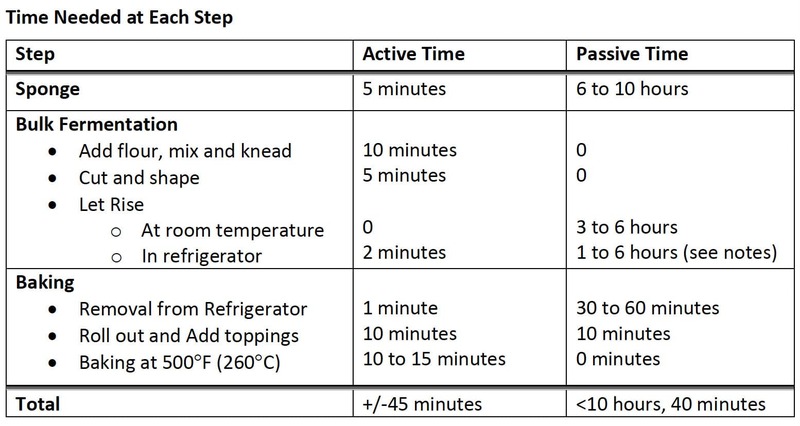 As you will see in the timetable below, you only need about 45 minutes of active time to prepare your dough and then to create and bake one pizza. Note, however, you will need 15 more minutes for each additional pizza that you make. This timetable also does not take into account the time required to make your pizza sauce, if you create it yourself, and to prepare the toppings. If you have sourdough starter, this recipe is for you. If you don’t have your own starter, ask friends who do for some of their excess starter. They will be thrilled to give you some of theirs. With little preparation, you can have a fun pizza night with friends. Each person adding their favorite toppings on their individual pizza before putting it in the oven. Or on a section of a larger communal pizza. Creating pizza with friends is a wonderful way to spend an evening. Also lovely as an ice breaker for guests who don’t know each other well. By the end of the evening they will have created bonds. Try this recipe and see. Making your own Sourdough Pizza Crust will bring your pizza to higher level. Not only is Sourdough Pizza Crust a wonderful way to use up extra sourdough starter but it also produces a pizza with a slightly more fluffy and chewy crust. Pour the sourdough starter into a large bowl. Add the water, sugar and then the amount of flour indicated for the sponge step. Mix together gently with a wooden spoon. Cover the bowl with a cheese cloth or a dish towel. Leave the covered bowl in a place sheltered from drafts for 6 to 12 hours. I usually prepare the sponge before going to sleep and leave it overnight. After the long rest, you will have a sponge (a frothy mix, with bubbles on top). The bubbles show the sponge is active. Add the amount of flour, salt and olive oil indicated for the bulk fermentation stage into the glass bowl with the sponge. Mix together with a wooden spoon. Let it sit a few minutes. Continue mixing with a spoon until the dough starts coming together. Turn the dough out onto a clean floured board or hard surface. Knead the dough about 5 minutes. If the dough is sticky, add a little more flour. Or if dry, add a few drops of water. The dough should not stick to your hands when you knead it. Divide the dough into four parts. Place each part in a bowl with enough space for the dough to double. Cover each part with a cheese cloth or clean dish towel. Let the dough sit about six hours until it has more or less doubled. The skin of the dough may start to feel a little dry or the top may begin to crack. Preheat the oven to 450°F (230°C) (see notes) with your pizza stone or pizza pan inside. I use a cast iron pizza pan (see above) with great results. Let the heat at the indicated temperature for at least 10 minutes. Place parchment paper on a pizza peel or flat surface. Add flour on the parchment paper so the dough will not stick. Gently pick up one of the parts of dough and roll it into a ball. Put the ball on the floured parchment paper. Flatten it down. 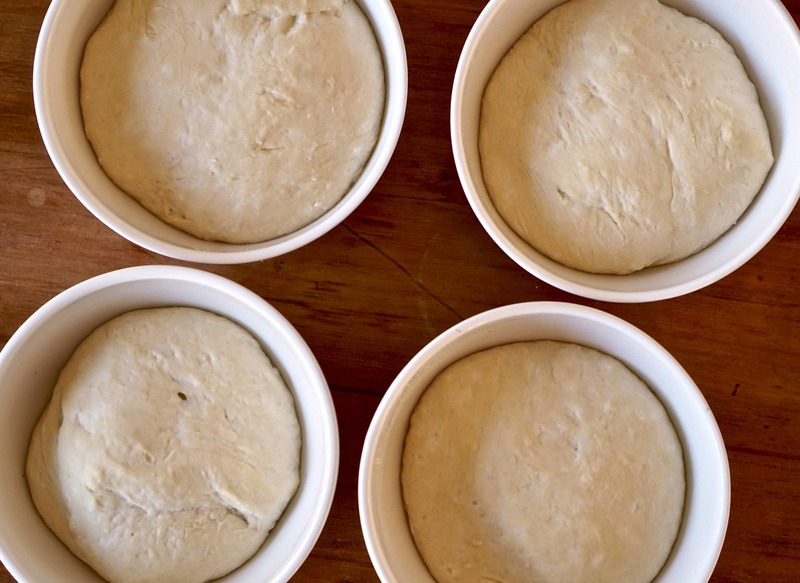 Place your hand on the dough and start stretching the dough out in the form of a disc. Continue gently stretching while being careful not to stretch it too thin or to make holes. Pick up the dough and place onto the back of your hands. Gently stretch the dough with your knuckles out until you get the desired thickness. Use a fork to poke holes on the pizza dough. Spread your tomato sauce on top of the pizza, leaving the edges bare. Be careful not to put on too much sauce or your pizza will become soggy. Add your cheese on top of your pizza. Then add the other toppings. Do not overload the pizza or the dough may not support the toppings. Let the prepared pizza sit 5 to 10 minutes. I usually let it rest while I prepare the next pizza and the last pizza is in baking in the oven. Place the pizza in the oven. If you use a pizza peel it will be easy to flip it onto the pizza pan. Let it bake about 10 minutes or until the crust turns golden brown and the cheese and other toppings look cooked. Remove the pizza from the oven and let it sit a couple minutes before slicing it. Enjoy it! When making the sponge, you can use a blend of flours. For my pizza crusts, I mixed one-half unbleached bread flour and one-half all-purpose flour. Note that you will add flour at two stages: the sponge and the bulk fermentation stages. You can leave the dough in the refrigerator up to five days during the bulk fermentation stage. However, be careful they are covered well so they do not dry out and become crusty. One of the best pizzas I've ever tasted let their pizza dough rise at this point 5 days. Experiment to see what works best for you. For the bulk fermentation in the refrigarator. 1 to 6 days ?? Hello, hours! I will make this more clear. Thanks, Dimitris! I hope the directions are correct because I am counting on a 3-day-long bulk fermentation. I wasn’t sure if you had already clarified the recipe or not so I’m keeping my fingers crossed. My dough looks and smells great, so time will tell. Thank you for the recipe. Hello Priscilla, I’m not sure what needs to be clarified in the recipe. I’ve re-read it to see. The bulk fermentation could take up to 12 hours (up to 6 hours at room temperature and then up to another 6 hours in the refrigerator). Can you let me know what is confusing to you? Thanks! One thing that was a bit confusing is the note at the end of the recipe says the bulk ferment can go up to 5 days in the fridge. When you print the recipe, the notes at the bottom are different and there is no mention of the multi-day bulk ferment. I’m trying it with 00 pizza flour. Hello Neal, thanks for your question. The same end notes should appear on the printed copy as well as on your screen. It does when I try to print it. I can see how it might be confusing because I describe more options in the article than I do in the recipe itself. Many people prefer being told one way to make a dish, rather than have options in the recipe itself. I will review the post to clarify. If you want to extend the bulk fermentation past the initial 6 hours (max), put the dough in the refrigerator after this initial time and let it rest (covered) in the refrigerator. Let me know how your recipe works. For the first time, don’t keep in the refrigerator several days. Try this after you get the hang of the pizza dough. I look forward to reading your feedback. I made this dough yesterday into today, measuring carefully. Mine was so wet, I needed to add over a cup of additional flour. However, the final product was excellent. It has the exact flavor I’ve been looking for in pizza dough, and came out crispy on the bottom and edges with a chewy interior. We baked it on a preheated pizza stone. Hello Pat, thanks for your feedback. The amount of flour that is needed may vary depending on type of flour as well as the temperature and humidity in the room. It may also depend on the hydration ratio of your sourdough starter. You seem to be a skillful enough baker to have correctly adapted the amount of flour. I’m so happy you enjoyed this dough and hope you will share it with your friends. This can be done properly after 6 hours fermentation at room temperature. The recipe says 4 pizzas, but what diameter? When I stretch the dough out, how thick should it be? Sounds tasty! Just need a little more info. Thanks! Hey Julian, it makes pizzas with a diameter of about 10″ / 25 cm. Depending on your appetite, each pizza is for an individual. I usually make several pizza when I have guests so we each can try pizzas with different toppings. Hi! Can you confirm that the OLIVE OIL measurement you list is 4oz by weight? Not volume? I was a little confused because you used grams for all the other weights, but if you were talking about volume, 4 fluid ounces seemed like a lot (8 tablespoons). So I wanted to confirm. Thanks! I look forward to trying this. Doing the sponge and bulk ferment all at room temp sounds like a better approach to me than some other recipes I have read, which call for more refrigeration! Hey Nick, thanks so much for catching that error. Not only should it not be in ounces, but it indicates twice as much as what it should be. I’ve revised the recipe to correct this error. I hope you will try this recipe and let me know how it turns out! Good luck! Hey Brad! I went to check the recipe this past weekend and saw that you had updated the Olive Oil to 4 Tablespoons. Thank you! I made the pizza crust this past weekend and all worked out great! We really enjoyed it. I’ve got two more doughs in the fridge, doing a 5 day bulk ferment. SUPER excited to try those out! Thanks again! 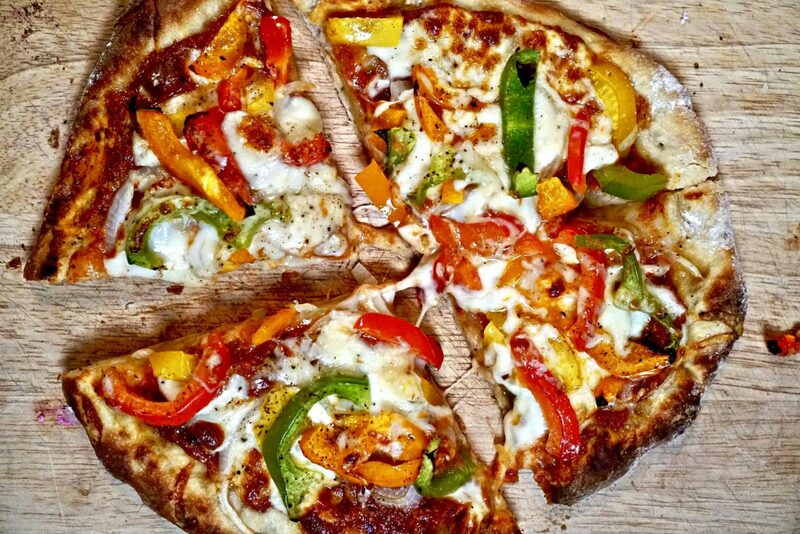 I used this recipe and everyone in my family prefered it to cultureforhealth pizza dough. I found the dough quite delicate to work with but the end result was delicious. The crust after day 5 in the refrigerator was also very tasty, chewy and convenient. I avoided rolling or tossing the dough rather gently stretching and pressing it onto a lightly oiled pan. I tried baking the dough first then adding toppings but found on day 5 that was unnecessary. The dough cooked up fine with light toppings so I will just bake once from now on. I wonder if a multigrain flour with more gluten will help make this dough more robust for tossing and rolling? Hello Janice, thank you for your positive feedback. The sourdough pizza crust is also very good after one day. Try letting it ferment less than 5 days to see how different the result will be. Adding multigrain flour would make the crust more dense and heavy. Surprisingly white flour has more gluten than multigrain or whole wheat flour. Multigrain flour has more fiber and is more healthy, but won’t help make the dough more elastic and chewy. I hope you will try this recipe again and experiment by fermenting less time and by baking the dough once with the toppings. I can’t wait to read more about your future experiences. Hello Becca, once you place the dough in the refrigerator, the dough will not rise very much. It will continue to ferment, which will help the flavor and consistency. However, because of the cold it will not rise very much. I usually wait until my dough has risen how I like before putting it in the refrigerator. Please write back how you like this recipe and about your experience. Thanks. Would this dough be ok to freeze after the bulk fermentation stage? Yes, I have frozen it. Just let it defrost and come to room temperature before using it. If you wrap it in plastic, half way during defrosting open up the wrap a bit so the dough does not become soggy. If it is a bit wet, you can always at the end addd a little flour when you roll it out. Great question, Gretchen! Thanks! If refrigerating for several days, do you let it come to room temp before forming your pizza shape or rolling out? Hello Becca, I usually take the dough out of the refrigerator about 20 to 30 minutes before I start rolling it out to make pizzas. Thanks! Hello Selina, very good question. I think the sweetness depends on your sourdough starter more than anything else. Does your starter taste sour? Some people enjoy a sour taste and add items in the starter to enhance the sour flavor. For instance, I have added in previous starters some yogurt, beer, kombucha, buttermilk, and other items that I had on hand to enhance the sourness. My current starter, which is pure flour and water, is not particularly sour. My sourdough pizza crust is not very sour. In fact, it tastes much like my regular pizza crust, except for the texture and elasticity. Were you happy with your crust? Please write back.